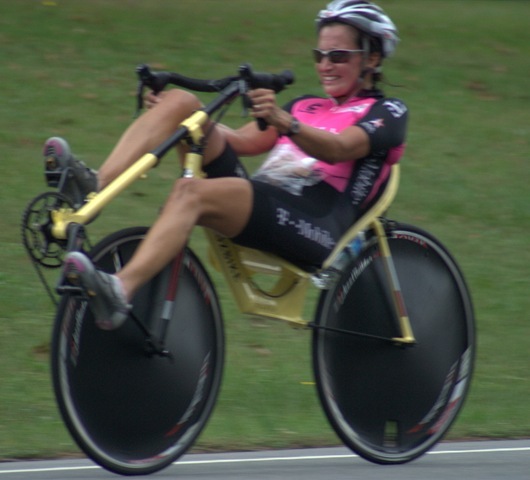 Maria Parker, recumbent cyclist, sets a world record riding Silvio Cruzbike Recumbent Cycles for a distance of just over 241 miles along a 20-mile loop at White Oak, in Bladen County, North Carolina on October 10, 2009. Congratulations to Maria and her team. See a more complete video here. Thanks Jim for your delightful (and flattering) coverage. Your presence there made a memorable day even more wonderful. Your enthusiasm for our record attempt and the terrific pictures and video were a great gift to the Cruzbike team. We cannot thank you enough! Next Next post: Well, it wasn’t the disc wheel & crosswinds after all.